This year I'm experimenting with using less refined sugars, so I thought I'd try sweetening a plum jam with honey. 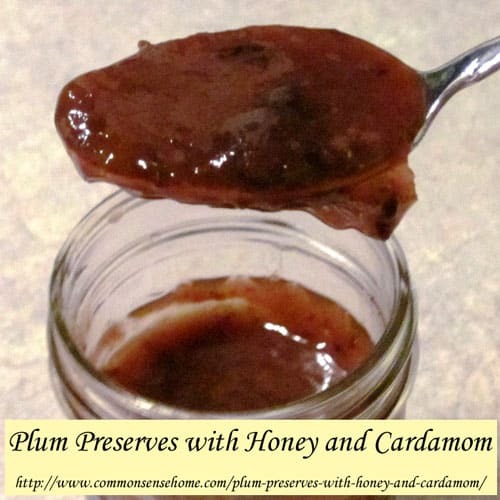 I wanted to incorporate cardamom, too, as I felt the flavor would complement the plums. A quick internet search came up with “Honey Plum Preserve” on Foodbuzz (now taken down). I'll share the recipe here, along with my own notes. Cover the bottom of a saute pan with honey. Place over low heat to warm the honey. Then add the chopped plums, and let them cook for 8-10 minutes, tossing them over to evenly coat them with the honey. Bring the mixture to a boil over low heat, stirring frequently. Add the lemon juice, orange juice and the cardamom powder and mix well. Now go ahead and add the water, and let it boil. Keep removing the white foam that forms at the top of the jam while cooking. When the mixture appears soupy and slightly thick, increase the heat to bring the mixture to a full, rolling boil. Once it becomes syrupy, the jelly is ready. As it cools down, it will transform into the sticky but thick jam texture that you are used to eating. Some people like it chunky, while others prefer it more even. If you fall in the second category, pass the fruit preserves through a sieve or colander, pressing hard to extract as much pulp as possible. Your jam is ready at this point, to eat right out of the pot! The original recipe didn't say when to add the pectin, or what type of pectin to use. Plums have some natural pectin, so if you have a plums that are less ripe you may not need commercial pectin. My plums were very, very ripe, so I figured I would need some. I did a gelling test to see if the mix of honey and chopped plums would set. To do a gelling test, take a tablespoon of alcohol and drop in a tablespoon of the liquid you are testing. Let it sit two minutes. If a firm blob forms, it has enough pectin. If not, you need to add pectin. I did not get a blob, so I mixed in standard powdered pectin to the honey and plums, because that's what I had on hand. I also added a teaspoon of butter to the fruit to reduce foaming. The ratio of sweetener to fruit is very low in this recipe, but the added lemon and orange juice makes it fairly acidic, which should help to preserve it. I packed my boiling jam in very hot jars and processed them in a water bath canner for 10 minutes. I ended up with about 4 1/2 cups of jam. The partially filled jar went into the fridge. The flavor is good, tart and spicy, almost a bit like a chutney. My only question right now is how long will it keep? I guess we'll find out, if it doesn't get eaten first. Thanks Laurie…..this recipe sounds so good. Wow you made it just under the wire…and it's weird. It's 10:28 p.m./central standard time and the blog hop was set to end at 11:59 p.m. CST…it is is already closed. I just went at looked at the site and yup it's all correct on there and time zone. If I remember correctly you are in NE Wisconsin, right? That is close to where I grew up (Maribel area) and I'm wondering if you'd be willing to share your contact for grass fed beef. We live in Milwaukee, but I get up there sometimes and I've been struggling to find some down in this area (especially that doesn't cost an arm and a leg). Would you e-mail me with an info you could provide on farmers, prices, etc? I enjoy your blog…can't wait to be out of the city myself! Mom has a Brooks Plum (prune) tree that always goes hog wild with plums. I did freeze a bunch, now I'm thinking I need to make this delicious preserve! Thanks for the recipe! Nice to hear from you, Candy! These preserves are yummy. My first batch is gone and I'm planning another. I love daramonn. Never considered it in a preserve. Awesome! Thank you for your submission on Nourishing Treasure's Whole Health Weekend Link-Up. Thanks for stopping by, Lea. I just made up a batch of this with Pomona's pectin and tweaked the recipe a bit, so I'll have to post the modified recipe, too. I should imagine the lemon juicecwill serve two purposes: Balance the sweetness from the honey and help the jelly to set. When I made plum jam in Tanzania I could not get pectin so just used lemon juice. Providing there is no ‘air’ left in the jars, the jam should last for years if it doesn’t get eaten first!! Thanks for the tip on how to check if the batch has enough pectin. By “alcohol” do you mean the drinkable kind or rubbing alcohol, or does it even matter? If you want to eat the test jam, use something like vodka. Otherwise, rubbing alcohol is fine.